I hope you will understand how forcefully this film struck me when I tell you I stopped making out to watch it. We teenagers cared primarily about getting away from the adults and getting our hands on each other. The primary locations for these precious moments came either in a car or at the movie theater, the still-widely-extant drive-in being the best possible combo. We didn’t care what was playing. Usually, we would get one of our friends who’d been to tell us the story so we could repeat it to suspicious parents later; back in the day, there was no internet to help out with spoilers. Older theaters were best – they had balconies and seats in nooks and crannies, where furtive lovers could commingle unobserved. The closest old-time movie palace to us was the Oriental. Built in 1927, it combined it ornate decoration of a period picture palace with the coziness of a neighborhood venue. (Frequently endangered, it was finally purchased and restored, and is now a top-notch live stage.) Arabic domes, Moorish murals, and crenelated screens turned the auditorium into an exotic refuge. She was my very first girlfriend, a wonderful baritone saxophonist with an instrument nearly her height. (I still get a little swoony when I hear Harry Carney solo on “Sophisticated Lady.”) I don’t know what she saw in me but I’m sure my incessant pawings didn’t add to my charm. For a time, all was bliss, though. At this time, the Oriental was a musty old house, unkempt with a catch-as-catch-can approach to industry screening standards. Few people went there. However horny we may have been, we did always give a film a chance, entwined together as closely as possible while still facing forward. “The Man Who Would Be King” is Huston’s last classic-period film -- the epitome of the old-school, no-girls-allowed adventure film. Huston adapts it faithfully from the original Rudyard Kipling story. Christopher Plummer, as Kipling, draws us effortlessly into the story within. 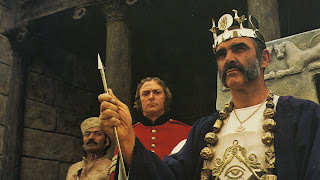 In British India in 1888, Kipling, editor of the newspaper The Northern Star, runs across two rogues, former brothers-in-arms now partners in crime Daniel Dravot (Sean Connery) and Peachey Carnahan (Michael Caine).Cheerful, insolent, and causally racist, they pass quickly through Kipling’s life, then return one night for assistance and witness. Huston’s putting these bleakly realistic words into the smiling mouth of a gleeful Sean Connery teaches us more about the allure of colonialism than a hundred books could impart. By shrinking the colonial impulse down to petty terms, Huston illuminates its pathetic absurdities. Connery and Caine are so damned charming in this bromance it hurts. Huston had dreamed up the project three decades before as a vehicle for Cary Grant and Humphrey Bogart, and these two actors, friends in real life, are the next best thing. They are very alive together onscreen – on their toes, really listening, having fun, playing in the true sense of the word. Huston was accused of not looking though the viewfinder on some of his later films; that’s not evident here. His longtime collaborator, Oscar-winner Oswald Morris was the cinematographer, and the widescreen compositions, sweeping and impeccably laid out, are some of the best examples of location and second-unit shooting out there. The cutting is unobtrusive, quietly propelling us along. In fact, the film is paced perfectly. Every sequence is as long as it needs to be, no longer; nothing extraneous is present. It’s an older and much more persuasive storytelling rhythm, too; it’s edited to a statelier metronome than we see in today’s jitterfests. The true dictum of cinema is, "Don't tell, SHOW"; and Huston packs every scene with nuance, telling us more with his visuals than he does with his dialogue. Daniel and Peachey trek over impassable mountains and find Kafiristan, and quickly conquer it. Daniel and Peachey find Billy Fish, a former Gurkha who acts as go-between between them and the Kafiristani. Billy is a hybrid – a comic, pidgin-English-speaking subservient in the original story, but here he’s played by the great Saeed Jaffrey as an intelligent man, in on the scam, amused by the English mind but faithful to English values. The duo find the perfect patsy in Ootah, buffoonish village chieftain, played by the incomparable Moroccan comic gem Doghmi Larbi. The unfamiliar is ogled at, derided, and romanticized. Our white male leads deride the peasants they conquer as a silly and superstitious lot, and for a time the camera takes their side. The drilling of ignorant, green troops is right out of a Ford cavalry film.But there’s something else at work here. We start in the world of Boy’s-Own adventures, where white male Christian values dominate and always triumph over those of any indigenous peoples they encounter. The further the pair drives into the heart of the country, though, the more the shadow of Otherness stretches over them. Danny is perceived as immortal due to a misguided arrow. He is crowned, and given the treasures of Alexander the Great, whose returning son he is thought to be. He begins to think of himself as eligible and fit to rule. And the tragedy of it is, he is. He adjudicates wisely. He brings unity and purpose and innovation to an isolated people. But -- there are mightier, more ancient gods at work in the land. The natives sacrifice infants. They behead their enemies’ heads and use them for polo balls. Against tribal law, Danny chooses to take a native girl as his wife, and reveals his mortality. He and Billy Fish and Peachey are doomed. Huston makes a film adaptation that’s vivid, eloquent, and pushes past the source material and makes something greater than the original – a fable about East and West containing sad truths. The price of overweening ambition is high, and the price must be paid – if only to implement a suffering narrator that will bring the story back full circle.